Since our last trawl through Newcastle and its surrounding areas, so much exciting stuff has happened that it’s hard to pick out the cream. If pressed, I’d say the highlight has been the Month of Fridays series, on which the curtain was pulled down in stunning fashion last week by Let’s Buy Happiness. Their balmy, life-affirming pop fun made them (probably) the best band of the month, but they were pushed hard by a phenomenal performance by Clock Opera the week before, as well as some great shows by the likes of Minotaurs, Mammal Club, Cauls and Holy Mammoth. You may recall I was anticipating the gigs pretty eagerly last time out, but they exceeded even my expectations, as did Sunderland’s Split Festival, which turned out to be a perfectly executed mix of great bands, great food and lovely surroundings. Looking forward, though, there’s still plenty to whet Geordie appetites before we all start getting obsessed with end of year lists. Coming up this weekend is Tusk Festival, three days spread across the Star and Shadow cinema and the Cluny which showcase a pretty diverse range of the finest avant garde talent around, including the likes of Grouper, Rhys Chatham, Cath & Phil Tyler and Bill Orcutt. The daytime sessions of the event also feature a couple of interesting-looking panel discussions on the state of independent music. All of this makes the 32 quid ticket price for the entire weekend seem very reasonable indeed. Tusk isn’t where the fun stops, though. Jeffrey Lewis plays the Cluny on October 24th, while Battles follow Wild Beasts and The Low Anthem in infiltrating Gateshead Old Town Hall on November 17th. Earlier that week (on the 12th), there’s a particularly sad double farewell at the Cluny, when Dananananaykroyd tumble into Newcastle for their last ever gig, which also happens to be the final show ever to be put on by Get Involved, a pair of promoters who have been responsible for some of the best gigs in our fair city in the last four years. A happy retirement to all concerned. Aside from those no-brainers, it’s also advisable to catch the glitchy atmospherics of Glasgow duo Conquering Animal Sound, along with the equally lovely Ajimal at Heaton Butterfly Cabinet on October 29th. Or, if you’d prefer to have your ears ripped off rather than kissed that night, surf-pop lunatics The Bubble Project reform for a special one-off gig at Newcastle Arts Centre, backed by John Egdell. Both will be running through their best albums in their entirety, a la Don’t Look Back. A week later, on November 5th (insert rubbish fireworks pun), the fine folks behind one of my favourite labels Cottage Industries throw an all day party at the Cluny, featuring the likes of The Union Choir, The Lake Poets, and Baskins Wish. There’s a load of other stuff going on in October and November too, but I’m already in danger of turning this page into a big gig listing, so do a little exploring, because there are some rich pickings on offer. As usual, there is an impressive selection of records emerging from Newcasle at the moment. One of my favourites of recent weeks is Transport, the debut EP by Mr Ben Sir, recently released on The Calico Print. It’s a beautifully elegant, mature trio of songs, perfectly fabricated to soundtrack miserable, rainy Autumn nights trudging down Northumberland Street avoiding early Christmas shoppers. Opening song 'Cambridge' in particular feels similar in tone to Alligator-era The National. I’m also partial to the new EP by Waskerley Way, La Magie Rouge. It’s a ridiculously adventurous project which takes slices of African music, drowns them in reverb, shoegazey guitar squall and, er, clarinet, producing an end product which sounds like some the most demented (and brilliant) kind of chillwave. 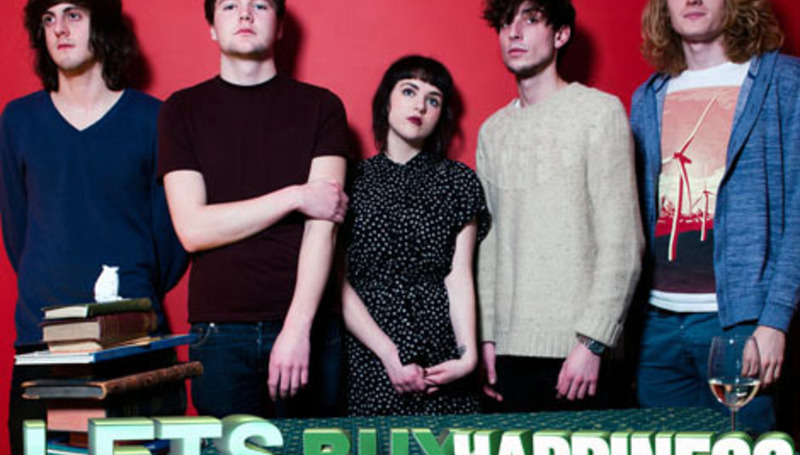 Far more conventional thrills come from the new Let’s Buy Happiness single ‘Dirty Lakes’, which is already out digitally, but gets a physical release later this month. If you’ve sampled any of their previous work, you’re not likely to be surprised by just how stunning a pop song it is, which does much to further their efforts to take over the world one gorgeous, sunny chorus at a time. They seem to get better with every release, and you can genuinely see the UK properly taking this band to their hearts in the months and years to come. While we’re on the subject of Newcastle pop wizards, apparently the next couple of months should see the release of Brilliant Mind’s Blyth EP, the prospect of which I’ve been salivating over since my first column four months ago. The next installment of Drowned in Newcastle will be a round-up of all the exciting stuff that has taken place over 2011, so why not tell me about what you’ve enjoyed most in the area this year?